Want to make the leap from paid employment to starting your own business but need a bit of inspiration? 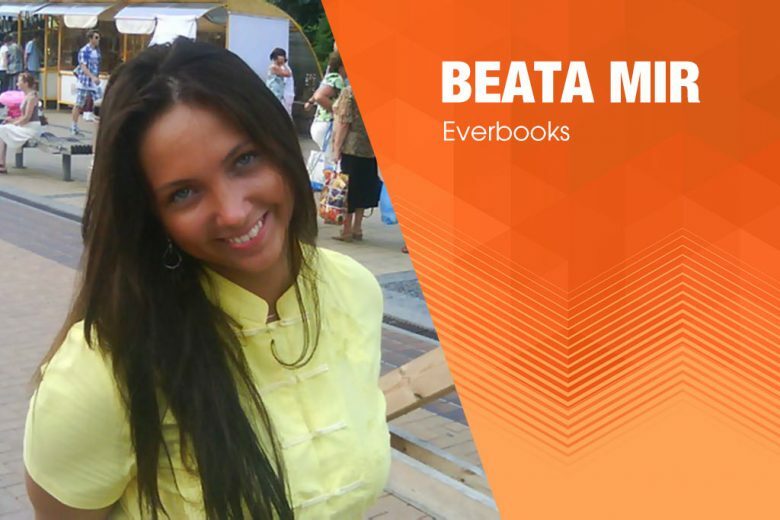 Read how Beata Mir turned her love of reading into an online secondhand book shop with a difference! I’ve got so many! I guess first and foremost, I’m a big sister to an amazing eight year old boy. I’m 24, so we have a big gap in there, but he’s my best friend in the whole world and I try to spend as much time with him as I can. I also work as a digital marketing manager at SSB Law, make animated business videos at Videxpress and on the top of it all, I’ve got Everbooks. What inspired you to start Everbooks? The Everbooks idea came to me when I ordered a copy of Anne’s Frank Diary from Amazon and, for a moment there, I thought that the receipt in it was actually a letter from it’s previous owner. I was very excited to know what did the reader think of it, how did he or she felt, reading the memoirs of such a spirited girl who left this world far too early. My boyfriend and I recently went to Amsterdam. Anne’s Frank museum is a big deal over there, and since I recently read the book, we’ve decided to go. I know I shouldn’t have expected much – the place is far too small to put up a large exhibition. But it was literally empty; nothing but the living quarters and some pictures. So, we walk in this large queue like little ducklings, looking around the suffocatingly small space and I spot pencil lines on a doorframe: this is where Otto measured the height of his girls. I imagine Anne, standing there, laughing and suddenly – I’m crying and I can’t stop. She had more life in her little finger then most people have in their entire lifetime, yet it ended so quickly. Suddenly, I’m feeling so lucky that i’m alive, crying in the middle of a crowded room with my confused boyfriend hugging me tightly. The previous owner of the book. P.S. If you’re ever find yourself in Amsterdam and decide to go to the museum, make sure you buy tickets online – the queue is endless! I wanted to share my experience and how deeply I felt about Anne’s diary, as well as so many other books. So, the Everbooks was born, because I believe that there are plenty of people like me, who would love to do the same. Everbooks is the ultimate online store for book-lovers. If you buy a book from us, you know that an Everbook is no ordinary book – it’s someone’s favourite. Ordering a book from us is simple – you just click and pay. It is when your book arrives that you experience a difference. A moment of excitement washes through you, for there is a special letter inside, and whoever owned the book last left it there for you. So you’d know how much they loved it and what they found so touching about it. With Everbooks you don’t just buy – you share. It’s almost like a virtue book club! What step have you taken to start the business? Everbooks is still in its infancy, and at this point, every like and share really excites me. The website is fairly new and our social media presence is growing. At the moment, everything is in that trial-and-error stage. But I’m really over-the-moon to know that there are so many people who love the experience and not only come back for more but send us their feedback and even share their reads with us. I’m very grateful for that. What’s been the trickiest aspect so far? Finding the time to ship the books. At the moment, all the orders come through me. Even when someone sells a book, I’m the first one to receive it. Then, I list it on Everbooks and ship it off to its new owner. But, if everything goes as planned, people will soon be able to list their own books online, just as they do on Ebay. And what have you most enjoyed? Reading the letters, of course! To me, a book is more than a purchase. It’s a teacher, a friend or even a world that I’ve never been in. So, it’s very exciting to read what other people say about their favourite reads. After all, some books stay with us for life and that unique experience is worth sharing. How do you fit your business around work? I know that good organisational skills are at the very core of productivity, but I’m truly horrible at it! So I just sleep less and my social life is suffering. But my friends know that if I really love something, I just get consumed by it. They’re very understanding. I guess I just have very good family and friends. Where would you like to see Everbooks in three years’ time? Everywhere! I want it to make books cool again. Now, when a kid sees a book, they think “Homework”. No wonder people don’t like reading anymore. It would be great to see Everbooks grow into a big community where people could share their favourite reads on a more personal level. Who knows, maybe having a pen friend could become a thing again? What advice do you have for other people who’d love to turn their passion into a business? The only difference between a success and a failure is that success requires you to try harder. The most successful people I know fail, get up and try again. Even Napoleon didn’t become the Emperor in a day (after being kicked out of army for desertion, he aspired to be a writer). So, whatever your passion is – believe in yourself and don’t stop trying! Want to buy or sell a book with a difference? Check out the Everbook website.